When it comes to laundry, Bosch washer dryers will make light work of even the most soiled clothes, and because you can dry too, you won’t have to hang your clothes on a line or wait all day before you can put them away. If you have a big family, you’ll know how difficult it is to stay on top of the household chores, so it makes sense to use appliances that can save you time and each Bosch washer dryer is fully programmable, so you can do quick washes that will also use less water and be better for the environment. 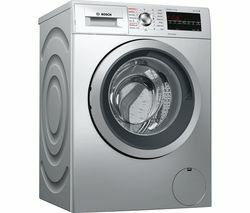 Bosch washer dryers are practical and affordable and can handle tough stains like blood, grass and grease with ease. Bosch washer dryers are compact so they won’t take up too much of your valuable floor space, yet they still have a generous capacity inside. If you can’t find a Bosch washer dryer you like the look of, check out our complete range of reliable, affordable Indesit washer dryers instead. And if you’re looking for a brand that’s synonymous with washer dryers, take a look at our selection of Hotpoint washer dryers. 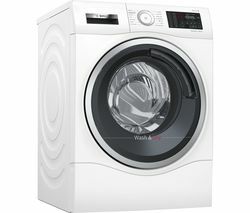 When you need to speed up laundry day, a Bosch washer dryer is the ideal appliance for your home.